It's a String ThingChallenge: Finished!! 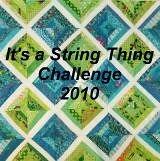 Because I sewed my strings for this quilt on a fabric foundation, it weighs a ton!! I broke many a needle. But once I found the magic combination of thread, needle and tension it went like a dream. I also stopped rolling it to get it under the throat of my machine and tried puddling instead. That made such a difference and everything moved along just great. And what a lot of bobbins to wind. All in all, it was an awesome learning experience for me and I am much more confident with my machine. Now I have to practice making another design instead of spirals! I have someone special in mind for this quilt. What an awesome quilt! very nice quilting. A beautiful quilt. I can't get over how creative everyone is with their strings. Thanks for all the lovely comments. I gave this quilt to my BQFF (Best Quilting Friend Forever). She was so happy. She has made lots and lots of awesome quilts for others but doesnt have one for herself. Now she does.